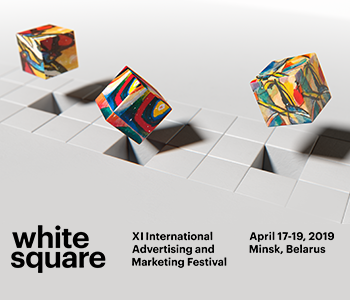 Globalworth and One Night Gallery bring together music, visual arts and technology at the next edition of Globalworth District, the first art&tech “quarter” in Romania. 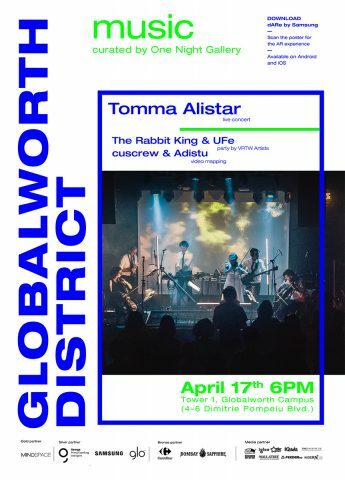 The event Globalworth District | Music Edition, will take place April 17th, starting 18:00, at Globalworth Campus, and proposes a new dimension of music, through means of technologies and creates a collaborative context for the Romanian artists in different fields. For a day, the lobby of the office building Tower 1 in Globalworth Campus (Dimitrie Pompeiu, nr. 4-6) will transform into a residence for the music and party lovers and will host a live concert with Tomma Alistar and two thematic parties with the artists VRTW – UFe Dj Set and King Rabbit – joined by interactive and video mapping installations created by cuscrew and Adistu. An unique element of the event will be an art installation that transforms into music bio data gathered from the plants and allows the visitors to experiment the manner in which the songs are changing depending on the fluctuations of the exterior environment. Launched at the end of February, Globalworth District, the first art&tech “quarter” in Romania,developed by Globalworth and curated by One Night Gallery, proposes itself to promote the young generation of Romanian artists and to bring the cultural events closer to the community, by transforming the office buildings into unconventional spaces that host and support the art and the technology. Globalworth District’s events are build into three pillars: music, visual arts and fashion, that can be experimented in a new manner, with the help of the technology. The guest becomes therefore more than a spectator, by being able to interact with the art and to discover it form a different perspective, in virtual or augmented reality. Tomma Alistar is a project launched by Alexei Turcan, that collects glimsis of his electronic adventures, combined ith classic instruments, all into an effervescent show. Downtempo jazzy or soundtracks for movies or theater can be found in its shows and the live interpretation proposes to give up the electro automatism and brings back the live music, with all its imperfections. UFe’s and Rabbit King’s eclectic music was augmented by cuscrew, a talented video mapping young artist. His style is a mix of 3 D shoegaze graphics and the one at the beginning of the 90’s. He was involved in many cultural projects and commissioned by names such as Electric Castle, Mindscape Studio, Spotlight, Summer Well and the newly launched Kajet Journal. Adistu, digital artist, curator and director of the itinerant art & video festival Tripoteca (festival already famous in 14 countries and 25 cities), had numerous exhibitions and live shows during many events dedicated to the visual arts. In his works it can be observed a predilection for fractals – mathematical models that mime the nature’s evolution and other approaches to digital-organic – mash-ups that create worlds and playful characters or suggest a meta physic humor. He will complete, with visual elements, Tomma Alistar’s show. Moreover, during the event, the visitors will be able to explore the Mindspace “capsule” and experiment through augmented reality with dARe by Samsung. And,because the interactivity and the encouraging for the public to experiment with new technologies is one of the most important ideals for the project, the participants will have at their disposal all the necessary tools to become DJs in virtual reality.